Just got back this weekend from our family trip to Bavaria and Austria, and it was great. Seeing real castle and city wall fortifications was inspiring, the Austrian Army (and Navy) museum was amazing (Rothenburg and Salzburg), I also read the Eisenhorn omnibus while on the plane (and started the Ravenor one), and I got the new White Dwarf magazine. So fired up on a number of subjects, which I hope to share with you soon. Unfortunately, I also traveled for over 26 hours to get home, and am currently a bit burnt out... so it will have to wait a bit. To recap, the quality of the Dwarf has been declining for a while, and about a year ago, I let my decade long subscription lapse. Then in the summer, there were some rumors of a relaunched White Dwarf, with new styles and new contents. The rumors turned out to be true, and I purchased a copy at the FLGS at the new price of $10. They had a large stack on the counter, and handed out 3-4 while I was in line, so it was clearly something that interested more than just me. Authorial voice - Gone is the bland advertising speak of articles past, and returned is obvious authorial interest in particular aspects of the magazine and new figures. This was a welcome change, and one that I had not expected. Photography - Muddy backgrounds for the chaos figures aside, the photography does seem like it has stepped up a level, and the higher quality paper seems to show it off well. Table of contents - Strange, but I was most impressed with this aspect of the magazine, which was almost an exploded view of the magazine itself. Studio behind the scenes - Seeing what various things the studio is working on is always interesting... even if we do not see the end results for years. Blanchitsu! - Bonkers Inquisitor conversions? yes please! Reduced advertisements - While there were more catalog pages, there seemed to be fewer of the traditional advertisement pages scattered in the middle of the magazine. Conversions - Converting is the part of the hobby I enjoy most, and has not featured as much as it used to. The Ork flyer is a kit that interests me as well, so a conversion article on it was most welcome. More "catalog" pages - Seeing a new figure from 6 different sides and then having a separate price page later in the magazine seems excessive, particularly since sprue shots are not one of the featured pages. Reduced text content - the new fonts and spacing seem to mean less words per page. Huge staff photos - I like that they have new pictures, but do they really need to be half a page in size? Until they hire more attractive staff, there is not much gained from this "feature". No 'Eavy Metal - A feature from the early days of the Dwarf, and one that should be back. The painting section was a pale imitation of previous ones, and needs to be improved. In conclusion, I quite enjoyed the magazine, and am looking forward to the next one coming out (next week!). I was not however, induced to renew my subscription, as the $100 price seems a bit much. Possibly after reviewing the next one I will be able to separate the nostalgia of reading the magazine again from the quality of its new incarnation, and can make a better determination. 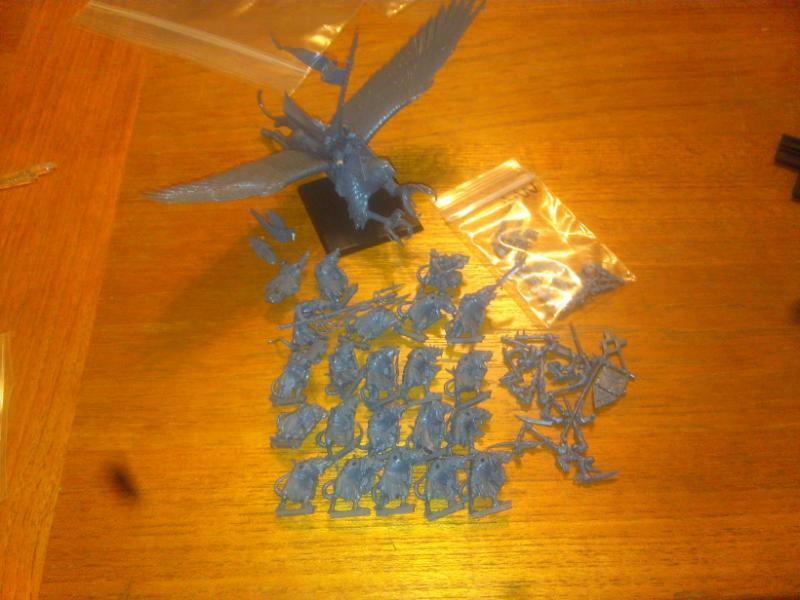 After a year or more, and at least 20 bids, I finally won a high elf griffon from the Isle of Blood Warhammer Fantasy Battle starter. I guess the market finally became saturated enough that my low ball bids had some success (fortunately for only one griffon and not all of the ones I was bidding on!). 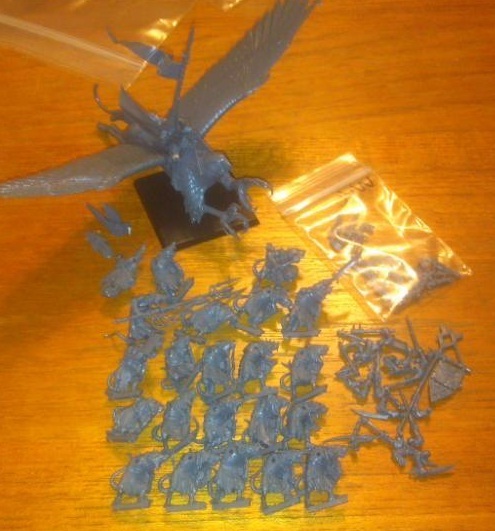 As is my custom with ebay, I then checked out what other items the seller had for sale... and ended up with a Skaven regiment and some bits. You can not tell from my crummy camera phone picture, but the sculpting is amazing, and the skaven in particular are super sharp, and have no duplicates in 20 figures, something that would be inconceivable when I started in this wacky hobby over 15 years ago, when plastic meant "monopose" 99% of the time. On the recommendation of Ckutalik(via this post on historical fiction for fantasy readers), I requested the book Gentlemen of the Road by Michael Chabon from the local library. A short novel or novella, it is about the adventures of a Fafhrd and Gray Mouser type in the 950s in western Asia; a fairly gripping read, I knocked it out in a couple of hours. The book itself is lovely, with two color typeset, and illustrations by Gary Gianni, who is apparently currently working on the Prince Valiant comics in papers. I recommend it for those who like quick adventure stories. However, like all good historical fiction, the real star is the setting, which here is Western Asia, and more specifically Khazaria, a Turkic empire established in 618 AD and lasted nearly 400 years. This empire existed as a sort of third wheel to the conflicts between the Eastern Empire to the west and the early Caliphate to the south, and contains names both known to most, and strange. The empire was multi-ethnic AND multi-faith, and had both a diverse economy and significant military activity. For a while at least the country had a dual kingship, with one king responsible for administration, and the other more of a figurehead (and held as a sort of prisoner in a palace). Unusually, the rulers of the country converted to Judaism in the 8th century, possibly as a way to stand in between their Christian and Muslim neighbors. Frankly, I think it would be perfect for a theft and insertion into a D&D game, or possibly outright use in a more historical game. The silk road and the multi-ethnic nature of the empire make it perfect for any random character to show up, and there would be plenty of raids to defeat and convoys to attack. With place names that are both familiar and foreign, and with a history merely sketched in by a few primary documents, it has much to recommend it for adventure. When I first started reading about Warhammer 40k online, I somehow stumbled on to Terragenesis, back when it was run by Gary James as a sort of proto-blog. He had all sorts of great projects, and in particular a Gothic church that caught my fancy. I decided to build something similar, when I turned my hand to terrain creation. 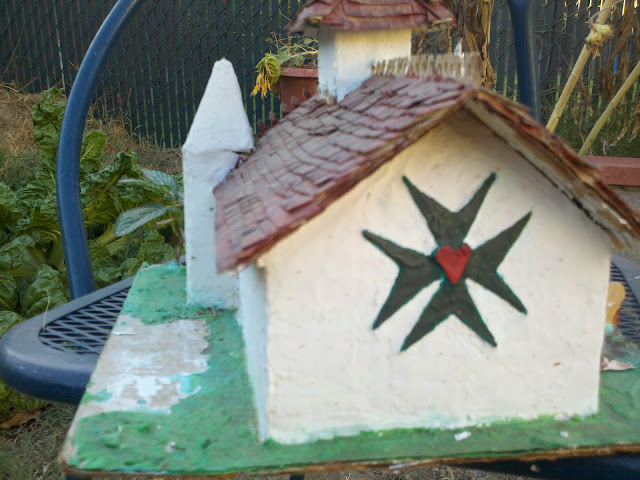 I created this as a sort of Sisters of Battle Chapel, since they had just come out at the time of its construction, and my then girl friend was interested in them. Construction was common cardboard with drywall spackle over it, details with thinner card and from various wood bits. 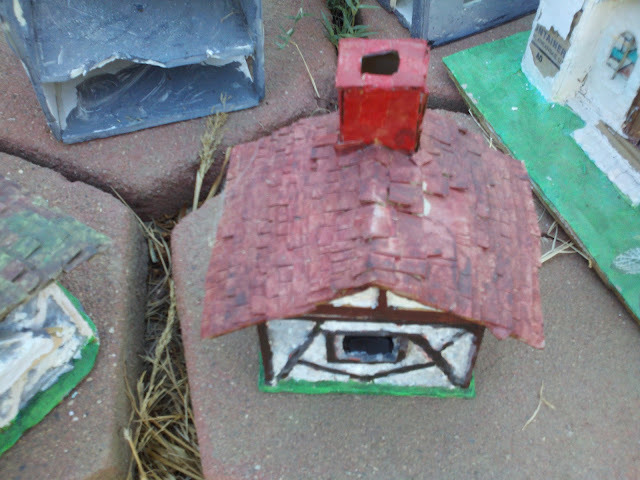 Paint was common craft acrylics. As a piece of terrain it was not very useful, since it was not accessible, and therefore became merely a large piece of LOS blocking terrain. 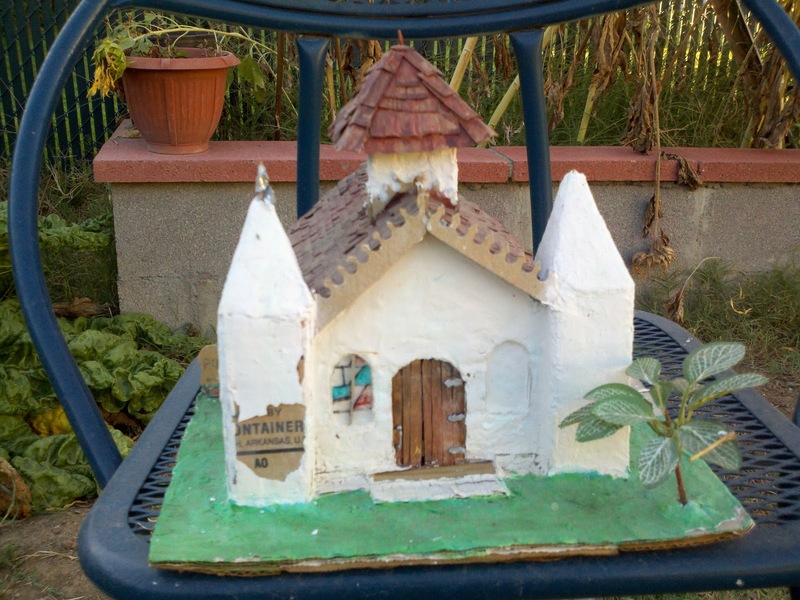 This cottage was one of two made to tie in with the chapel. As you can see, it had an interior, which made it marginally more useful than the chapel. 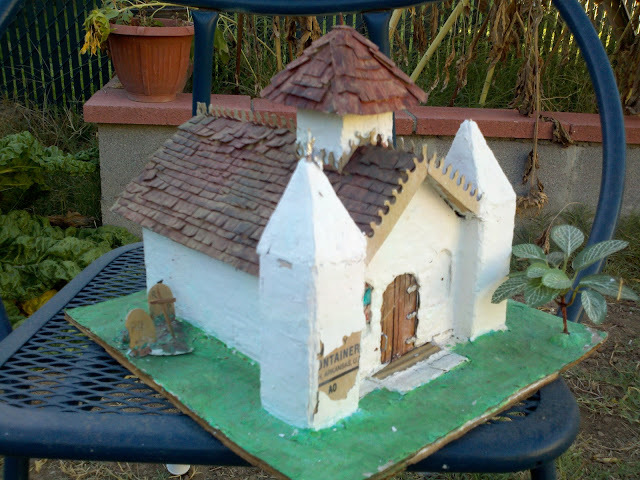 Again it was constructed from cardboard and spackle, although in this case it had half timber work done with various bits of wood. 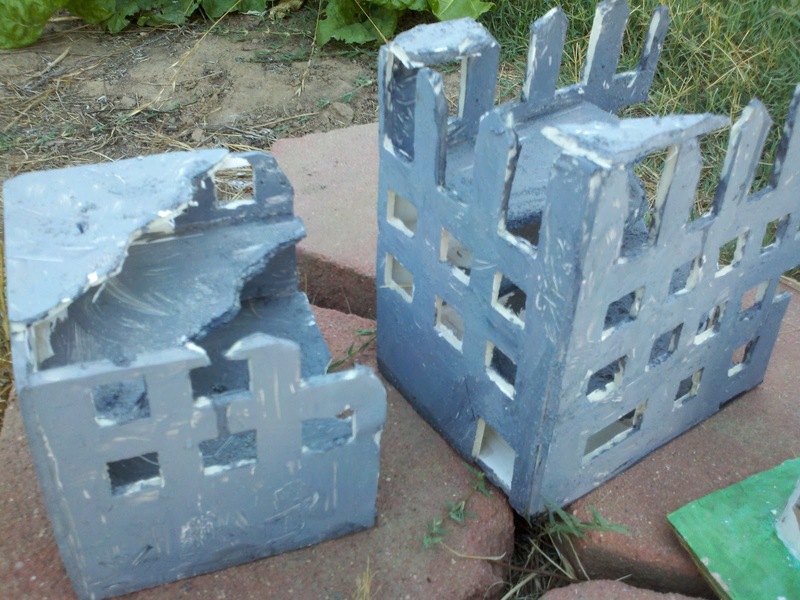 These last two buildings were part of a set of three that I made for an art project at school (and designed with an eye to using them for 40k). As I recall, we were supposed to design a memorial, and this was to be a memorial to "bombed out cities ruined by airpower" or some such, where the buildings would be constructed in a pit, and then the viewer would see them from above as if they were in a bomber. Sounds very "art class" no? Unfortunately, all of these buildings were packed up after I moved out of my apartment, and then languished in my parents' attic for a decade. They recently cleared everything out, and the box of terrain came home with me. I was going to toss it all out, but my son kept them to play with in the garden, where they have been suffering the effects of exposure for a few months. Once it starts raining again, they are headed for the trash. A pity, but they have not aged well, and I find them shockingly bad now.